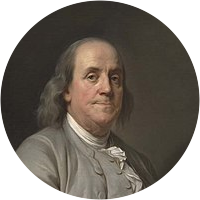 A collection of the best Benjamin Franklin quotations. A fat kitchen, a lean will. The muses love the morning. The morning has gold in its mouth. Many foxes grow, but few grow good. What begins in anger ends in shame. The rotten apple spoils its companions. One who lives on hopes will die fasting. Avoid extremes; forbear resenting injuries. An old young man will become a young old man. A man who multiplies riches multiplies cares. Leisure is the time for doing something useful. A man without courage is a knife without an edge. Love your neighbor: yet don't pull down your hedge. Pain wastes the body; pleasures, the understanding. A man that can have patience, can have what he will. Waste not, want not; willful waste makes woeful want. Let us then be up and doing, and doing to the purpose. I saw few die of hunger — of eating, a hundred thousand. Wealth is not theirs that have it, but those who enjoy it. The eye of a master will do more work than both his hands. If you would know the value of money, try and borrow some. Experience keeps a dear school, yet fools learn in no other. You can bear your own faults, why not the faults in your wife? At the workingman's house hunger looks in but dares not enter. Setting too good an example is a kind of slander seldom forgiven. If  man could have half his wishes, he would double his troubles. If a man could have half of his wishes he would double his troubles. To be intimate with a foolish friend is like going to bed to a razor. In America we believe in Life, Liberty — and the pursuit of happiness. Up sluggard, and waste not life; in the grave will be sleeping enough. 'Tis an old saying: That an ounce of prevention is worth a pound of cure. — Benjamin Franklin Life and Correspondence of Samuel Johnson, D.D. A bargain is something you have to find a use for once you have bought it. He gives twice that gives soon, i.e., he will soon be called to give again. Don't throw stones at your neighbor's windows if you live in a glass house. There are three faithful friends — an old wife, an old dog, and ready money. Teach your children to hold their tongues; they'll learn fast enough to speak. What's a sun-dial in the shade? Make no expense, but to do good to others or yourself; that is, waste nothing. There are three Things extremely hard; Steel, a Diamond, and to know one's self. He gives twice that gives soon; i.e., he will soon be called upon to give again. To be thrown upon one's own resources is to be cast into the very lap of fortune. Neither a Fortress nor a Maidenhead will hold out long after they begin to parley. Will be suspected if it come from you. Those who love deeply never grow old. They may die of old age, but they die young. Let all your things have their place; let each part of your business have its time. There never was yet a truly great man that was not at the same time truly virtuous. At twenty years of age the will reigns; at thirty, the wit; at forty, the judgment. Lose no time; be always employed in something useful. Keep out of all unnecessary action. There are two ways of being happy; we may either diminish our wants or augment our means. Arguing is a game two can play at. But it is a strange game in that neither opponent ever wins. If a little does not go, much cash will not come." — "He who restrains his appetite avoids debt. Most people return small favors, acknowledge middling ones, and repay great ones with ingratitude. Let man ascertain his special business or calling, and then stick to it, if he would be successful. When men are employed, they are best contented; for on idle days they are mutinous and quarrelsome. A man that is of the opinion money will do everything may well be suspected of doing everything for money. How many observe Christ's birthday! How few his precepts! O! 'tis easier to keep holidays than commandments. Tim was so learned that he could name a horse in nine languages: so ignorant that he bought a cow to ride on. Strive to be the greatest Man in your Country, and you may be disappointed; strive to be the best, and you may succeed. You will observe with concern how long a useful truth may be known and exist, before it is generally received and practiced on. Human felicity or happiness is produced not so much by great pieces of good fortune that seldom happen, as by little advantages that occur every day. The eyes of other people are the eyes that ruin us. If all but myself were blind, I should want neither fine clothes, fine houses, nor fine furniture. A man that raises a large family does, indeed, while he lives to observe them, stand a broader mark for sorrow; but then, he stands a broader mark for pleasure too. A man who hath a trade, hath an estate; and a man who hath a calling hath a place of profit and honor. A ploughman on his legs is higher than a gentleman on his knees. Happiness consists more in the small conveniences of pleasures that occur every day, than in great pieces of good fortune that happen but seldom to a man in the course of his life. Money never made a man happy yet, nor will it. There is nothing in its nature to produce happiness. The more a man has, the more he wants. Instead of its filling a vacuum, it makes one. ... names of virtues, with their precepts, were:1. TEMPERANCE. Eat not to dullness; drink not to elevation. 2. SILENCE. Speak not but what may benefit others or yourself; avoid trifling conversation. Wherever desirable superfluities are imported, industry is excited, and thereby plenty is produced. Were only necessaries permitted to be purchased, men would work no more than was necessary for that purpose. Temperance puts wood on the fire, meal in the barrel, flour in the tub, money in the purse, credit in the country, contentment in the house, clothes on the children, vigor in the body, intelligence in the brain, and spirit in the whole constitution. Friends and neighbours complain that taxes are indeed very heavy, and if those laid on by the government were the only ones we had to pay, we might the more easily discharge them; but we have many others, and much more grievous to some of us. We are taxed twice as much by our idleness, three times as much by our pride, and four times as much by our folly.